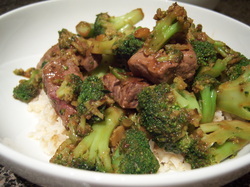 Toss beef with soy sauce, cornstarch, crushed red pepper and garlic in non-metal bowl. Cover and refrigerate 20 minutes. Heat oil in wok or large skillet over high heat. Stir fry beef until no longer pink, 5 minutes. Stir in broccoli, onions and water chestnuts; cook 2 minutes. Pour in broth, and bring to a boil. Stir in peanuts, cook one minute more, and serve.